From my previous posts, you'll see that I have considered my angel and hospital tanks as the "clean" tanks. They have been consistently at low ammonia levels. Although cloudy, my goldfish tank has normally been around 1ppm of ammonia. And the danio tank has been my "dirty" tank - consistently around 4 ppm of ammonia. Today I took samples of the goldfish tank and danio tank to test. One of the tubes immediately turned green (from the goldfish tank) and I thought I got the samples mixed up. I retested the danio tank. Lo and behold! The danio tank is now showing 0 ppm ammonia! Look at it. It's yellow, right? Yeah, that's yellow. I was so surprised. 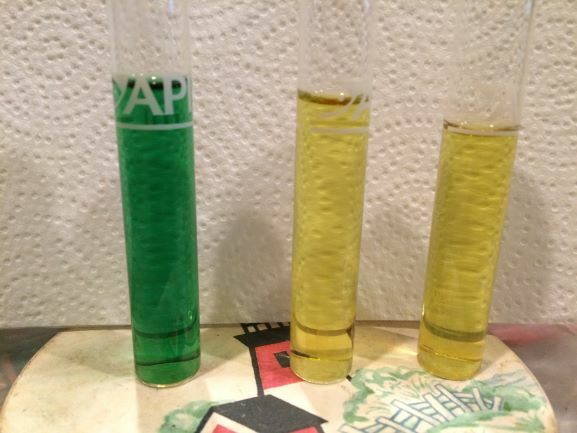 Since I finally got a good ammonia reading, I finally started doing the other water tests. The pH is 6.8 -- Nitrites are 2 ppm - Nitrates are either 40 or 80 ppm. Step 1 of the nitrogen cycle has completed - where the bacteria on the filter/tank is converting the ammonia to nitrite. Now for the "other" bacteria need to grow that feed on the nitrite and convert it to nitrate. Step 1 looks like it's done. That's the good news. The bad news is that since the goldfish tank was moved, it has remained cloudy. And now the ammonia is up to 4 ppm. I took the hornwort out of the tank to grow it in a small tank by itself. It's supposed to grow fast - so when I get some extra, the goldfish get it back. That may have contributed to the bad reading. Regardless - it's time for water changes.